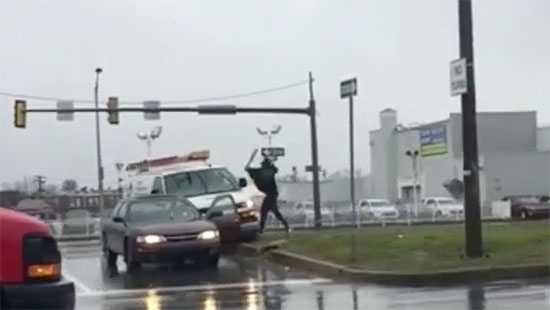 Philadelphia Police are investigating after cell phone footage captured a violent road rage incident in Northeast Philadelphia last Thursday morning, 1/24. It happened at the intersection of Levick Street and Roosevelt Boulevard. A maroon sedan was on Levick Street sitting at a red light when it was struck from behind by a white work van. It accident was just a fender bender. In the video, the driver of the sedan gets out and approaches the van. The driver of the van never gets out, but the two have words. You can hear screaming on the video. The sedan driver then get a baseball bat and starts smashing up the side of the van. "The offender jumps out of the car with a baseball bat, runs up to the complainant's vehicle, smashes the driver side window out and knocks the mirror off," said Philadelphia Police Lt. Dennis Rosenbaum. "On top of that, he tried to flee the accident," Rosenbaum adds. "The two vehicles were still stuck together. He caused more damage to the vehicle when he ripped the bumper off of the truck while trying to flee the accident." Police say that $1000s worth of damage was done to the truck. A New Jersey electrical contractor pled guilty to charges stemming from a lengthy federal probe of IBEW Local 98 on Monday, 1/28. George L. Peltz, the owner of MJK Electric, pleaded guilty to 10 federal charges, including tax evasion, theft from employee benefit plans, and unlawful payments to a union official. The indictment says that Peltz gave the unidentified official a $37,000 security system; gift cards, electronics, and large-screen televisions to the official and his family; and did $3,000 worth of work for the official’s relative. The official is not named in the indictment, but the probe has focused on union leader Johnny Dougherty. His home and office was raided by FBI in August 2016. Federal charges against others in the probe are expected on Wednesday, 1/30. A busy intersection in Center City is going to be closed for a few more weeks as crews continue to work on fixing a hole that opened up last week. On Monday 1/21, a sewer line collapsed causing the road to buckle and a hole to appear in the middle of the intersection at 20th and Chestnut Streets. The Philadelphia Water Department says it will take two to three more weeks to repair. "For the time being the street will be closed. Chestnut Street and 20th Street in both directions, and we'll have crews out working here until repairs are made - and the street is back open - which should take two to three weeks," said John DiGiulio of the Philadelphia Water Department. The sewer line itself is 148 years old. Bricks were missing causing the collapse. They have to be very careful while excavating because of nearby electrical and gas lines. Chestnut is closed between 21st Street 19th Street. 20th Street is closed from Sansom to Market. Area businesses and residents are feeling the impact. The Philadelphia Phillies have announced that former SS Jimmy Rollins has returned to the organization as a special advisor. He will work on both the baseball and business side of the organization. His roles will include "spring training coaching, meeting with sponsors and suite holders, fan engagement and community outreach." Rollins is the franchise's all-time leader in hits (2,306) and doubles (479). He was the 2007 National League Most Valuable Player, was selected to three NL All-Star teams, won four Gold Glove Awards, one Silver Slugger Award and was the co-winner of the prestigious Roberto Clemente Award. "It goes without saying that Jimmy was a huge part of the team's success during the five-year run of division titles and he is one of the greatest players to wear our uniform," said Executive Vice President David Buck. "His acumen for both business and baseball makes this a natural fit. We are excited to have him back." Rollins will be honored on May 4 with a retirement ceremony at Citizens Bank Park.